A scene that can only be experienced from horseback. 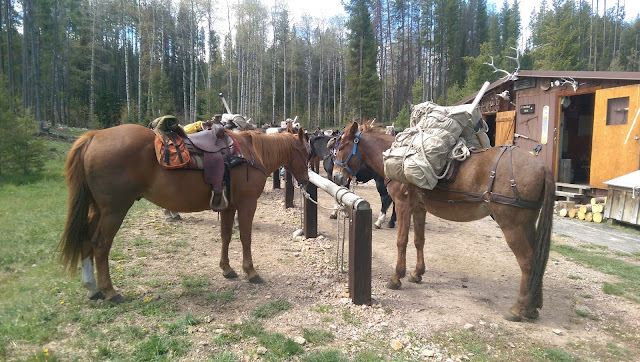 In an attempt to make all my military training relevant to a civilian career, I have recently attended (and graduated) from ROYAL TINE Guide and Packer school in Philipsburg Montana. At first I thought that with my experience as a military scout and mountaineer I should be able to apply those skills to hunting and or guiding without any problems. Never-the-less, I decided to get some training just to fill in the holes. It is a good thing that I did because sometime you just don't know, what you don't know. I registered with Royal Tine, gathered the required gear and set out for Montana. The folks that run the school are some of the coolest most genuine people that I have ever met. Cody and LeRee' Hensen are straight shooters, they do no not try to sensationalize the job as a guide or packer. In fact, at first it almost seemed like they made the job seem like more trouble than one would expect. From the outside looking in this appears to be a poor business practice to talk people out of attending the school, in fact it turned out to be as sound as the curriculum. You see they keep the attendance small and the days full of training. There is very little idle time and anyone that is not fully committed would probably have a hard time keeping up. That said, Cody is a phenomenal instructor which isn't surprising considering that he has been refining this training for over 20 years. They also had an assistant instructor named Bird, Bird is a very capable outdoors man and he is one hell of an instructor. Royal Tine tack shed and classroom. The kitchen is run by Cody's better half LeRee', and she is a master at her craft. The cuisine during the course was diverse, plentiful, and restaurant quality. The cook tent is a traditional wall tent with a dirt floor and logs for chairs. It has all the charm of a back country hunting camp. One major exception is the cleanliness of the kitchen/dining area. I am still amazed at how clean she keeps that kitchen. You would have a hard time finding a stray crumb in the entire facility. This is in fact a necessity that has been learned over the years as the cook tent has been the victim of a bear or two in the past. Not surprisingly, we did not experience this type of event while at the course. The menus most often consisted of various wild game dished prepared primarily with elk and antelope that were harvested by Cody and LeRee'. I cannot imagine that it is possible to live in a field environment and eat as much or as well as the students at Royal Tine. On a side note, LeRee' also runs a camp cook school so anyone can learn how to cook and maintain a kitchen in camp like royalty. There is also a smaller course centered around dutch oven cooking. Did I mention that the entire kitchen is run off of propane, a fire pit, and one wood stove. Cody has the course max set at eight guide students and it fills up much faster than you might believe. At the start of the course Cody and LeRee' laid out the camp rules and policies. They collectively covered everything from maintaining our quarters to how to conduct ourselves at meal times. Every camp rule also came with an explanation as to why this particular rule is in place. In most cases they are a result of safety, avoiding animal infestation, or simply good backwoods etiquette that the client would expect from a professional guide. After the rules were laid out we were given time to settle into our tents and prepare our gear and living arrangement. There are two guide tents that house four students each and they are equipped with a wood stove and a wooden door, floors and cots. After we were settled in we immediately began classes on horse and mule identification and confirmation. WOW, Cody doesn't waist any time getting down to business. If you are considering a career change into this profession I would recommend reading the following two books. They both contain sound information. Of course there are many more good books on the subject but I believe that these two are the standard to be met. It is not required that you know what you are doing before you get to the course but the more you know then the more successful you will be. It is quite a daunting task to learn so many subjects in such rapid succession without a little prior knowledge. Just simply understanding some of the terms and buzz words before you go will aid in success. The next week was a blur of trail rides, line splicing, saddle and tack repair, horse shoeing and some basic equine first aid and maintenance. After we demonstrated some competence around the stock we were given a rotation of which we would be the wranglers or the camp jack. Wranglers, wrangled the stock and performed other stock related chores each day. The camp jack performed such mundane tasks as making the morning coffee, lighting the stoves, splitting wood and putting out the wash water at the chow tent. The assignment of these chores really made it feel more like a back country working environment rather than a school. Any guide that works for an outfitter will have theses tasks to perform in addition to the regular guide and packer duties. Royal Tine does a great job giving the students the entire experience. Sundays are a half day off and Mondays are off entirely. These days provided a much needed rest period and time to absorb all the information that was learned during the week. I spent my days off with a visit to Philipsburg thrift shops, lots of fly fishing, and a few beers at the local watering hole. All recharged its time to begin week two, we jumped right back in where we left off with some knot tying and eventually packing some mules for practice. We packed and pulled a few strings of mules on some short rides and surprisingly did quite well. 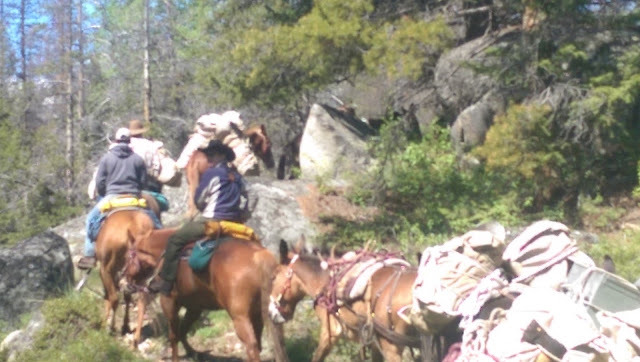 To go from zero experience to packing a string of mules and pulling for a few miles, on a horse that I saddled, was amazing. Keep in mind that when I showed up I had almost no experience around stock animals my entire life. So at this point I have gained an immense amount of experience with handling stock, repairing tack, and all manner of cowboy skills. Now that we were all proficient around the animals and competent enough to be counted on to complete these stock related chores, we moved on to the hunting portion of the course. BOZ the horse and ABE the mule, my travel companions on this odyssey. Narrow rocky mountain trails, no problem. Just a walk in the park. We had many classes on all aspects of guiding and hunting. We learned about the habits of the animals that we would be expected to guide for. Cody and Bird led us on some mock guiding operations where they played either the game or the client depending on the lesson that they were teaching. We stalked bighorn sheep (for real) and that was amazing to see them in their natural environment. We crossed paths with many deer, elk and black bear. We even stalked up on a bear happily munching on a cow elk carcass and the raw power of that bear left us breathless. It was truly a sight to behold. Hiking in for the mock sheep hunt. No roads where we are going gents. Glassing the next ridge line. The quarry has been spotted! After the hunting portion we focused on the real hard work part of guiding, Cody and Bird gave classes on blood trailing, and even green scoring and field scoring the trophies. Blood trailing was a challenge even for me with a professional tracking background because the fake blood used was diluted by the rain and almost completely washed away. The lesson plan was sound and we performed the task quite well under the circumstances and found the quarry. It was great for me to get back out on a track line and feel that doubt and wonder once again. Fortunately, experience has taught me that if you stay focused the tracker will prevail. We also received classes on care of hides, trophies and meat, and even different caping techniques depending on how the client wants his trophy mounted. I never even would have thought to ask that question. In addition to everything else we were tested on hunting regulations and rules. After which, we had a lengthy discussion about hunter and guide ethics and Cody gave many examples of some of the hard decisions that a guide may have to make. Many of those decisions have no good answer but he gave us some sound advise to help guide us to make good choices when faced with those decisions. Additionally, Cody gave examples of many times that he has had to make a hard decision, some of his choices were obvious and some not. This portion was a real eye opener and a very valuable part of the training for anyone that truly plans on guiding for any type of hunting outfit. We also received our Red Cross Heart saver CPR certification because this is a requirement for any guide. We took a day and Cody taught us how to maintain trails to the National Forest standard in or out of a designated wilderness area. After the class Bird took us out for a little practice and we used a variety of axes and cross cut saws to clear trails and process firewood. Not all hunting areas allow the use of power tools and chain saws so it is important that the guides know how to perform theses tasks with tools that are allowed. This is just one more thing that proves the folks a Royal Tine really understand what you will need to be successful in guiding career. I am in cross cut hell! Posing like a poser do! At the end of the course we set out on a pack trip so that we could put the skills to the test. We packed all the necessary gear and equipment on the horses and mules and set out for the mountains. 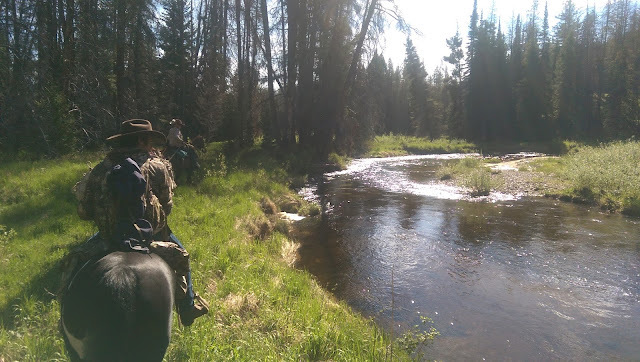 on the trip we learned about setting up a portable corral, rotating stock and how to keep them fed and watered while in the back country. The pack trip was one of the most enjoyable parts of the trip for me. Although the workload was fairly light we still managed to keep busy by exploring and experimenting in the forest. The field kitchen, all packed in on mules. My living arrangement, not to shabby! I love presents from the forest! Taking a break from all the stress, yea right! Now where did I put my fly rod? Now consider this, You need not know very much before this course. One gentleman in my course actually quit a job in the city with a well known tech firm to go and become a guide. He had very little knowledge of the outdoors or hunting. He worked hard at the course and was provided with referrals. Upon graduation he had a job with an outfitter and was on his way. You see, Cody will give the successful students job leads but they must make the calls and land the job by themselves. As a testament to the quality of student that graduates Royal Tine, every student that wanted a job with an outfitter, graduated the course with a job. Now that is a record to be proud of. If you decide to sign up for the course go to the web site and open a line of communication with Cody and LeRee' first ROYAL TINE GUIDE AND PACKER SCHOOL. Royal Tine is also VA approved and you can use your GI Bill to attend the course. LeRee' will make this easy for you if you contact her and keep a good line of communication going during the registration process. They will send you a registration packet and a gear list. below are a couple of specific items that I was either really glad that I had or wish that I would have had. Some are on the gear list and some are not. Just click on the picture or the link to see more about the item. On these specific items don't skimp, they are worth their weight in gold.